There’s a lot in life that requires courage when you think about it. We often view courage as a chest-banging, sword-wielding warrior type, but I think it can have a gentle face too. Gentle, tenacious and steadfast. 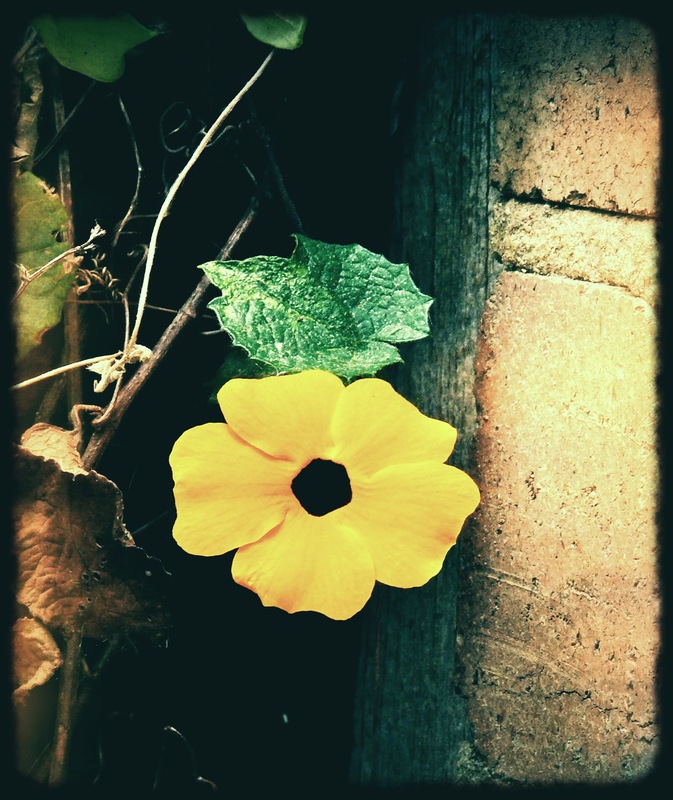 Like this flower growing through the bricks. And this quote, so true and so relevant to the lives of many of us right now. Have a week full of gentle courage, everyone! Things That Make You Go Oooooooh! This is beautiful, Selma. There are many of those brave blossoms out there, quietly surviving and succeeding. I know one of them very well. I love this quote, Selma! It is so easy for the big and mighty to be brave. So much harder for us far more fragile humans, the ones who feel deeply and care much. Courage is having perseverence, holding on to hope and faith despite terrible odds, it’s about the power of inner strength and determination. Sometimes courage is simply getting out of bed to face another day, and sometimes courage is knowing when to walk away. Courage makes the weakest of us mighty when the time is right, and it is a beautiful thing to see! Beautifully said, Josie. I could not have said it better myself. You really sum things up so well. I agree 100%. One hundred per cent. OH YEAH!!!! Just love the sentiment expressed in your post…have a great week! Awww thanks, slpmartin. You are so lovely! Oh Selma! I so NEEDED to hear that! Thank you!! You are MOST welcome, Meleah. I needed to hear it too! So true 🙂 lovely quote to start the week. Have a good one Selma. Wonderful quote Selma, one doesn’t need to be loud and obvious to show courage. We have a sunflower growing out of a dead tree stump, in between 2 barb-q’s and in the midst of huge grape vine clusters. That is amazing about the sunflower, Cathy. They are such hardy flowers. I have seen some grow in unexpected places too. Have a FAB week! Absolutely beautiful quote, Selma, and something we so often forget in the rah-rah of celebrating “great heroes” – ordinary people can be heroes too just by having the courage to bloom again after the snow. Thanks for your comment on my blog (I finally got around to answering it!) – hope all well? The ordinary hero is my favourite kind, Judy. We need to celebrate them more, I think. I am enjoying your blog a lot. Looking forward to reading more! Selma, never a truer word was said – love this 🙂 hope your week is spectacularly peaceful! Some quotes really resonate, don’t they, Bandsmoke? I really like that one too. It says a lot! Hope you’ve had a lovely week so far. Thanks again for this Selma. You seem to know exactly what I need to hear. It is often very courageous just to keep moving forward. Need to remind myself about that. I needed to hear it too, Lauri, particularly when my overriding feeling right now is to hide under the bed. Just getting up and facing the day is an effort. But it is getting easier….moving forward has very restorative benefits! Yes, yes it is. So beautiful.